There is something different about ELaiolithos….. It does NOT have pretense…. Nutrition is vital to everyone’s health! Helen’s (the owner) belief is that in order to feel great and stay well we must choose healthy food, but equally as important are the beverages we choose to consume. Healthy drinking starts with healthy soil – and ELaiolithos is privileged to be surrounded by the non manipulated land of Moni, Heimarros, & Kinidharos where organic and bio dynamic farming cultivation takes place. Helen also believes that drinking is an Art and because Naxos’ hinterland offers a great variety in herbs, spices and products, she invited the “Pinoume Ellada” Connoisseur (a respected Greek mixologist for his knowledge and cocktail craftsmanship skills) who took her ideas, applied his scientific mind, and invented/constructed these new pristine intriguing cocktails with impeccable local ingredients and products resulting in small symphonies for the mouth. The cocktail names are all inspired by Naxian culture, lore and history. Each one is truly innovating, unique, and tells a story while promising an experience. The TAP WATER is safe throughout our establishment. It comes from Moni village which is privileged to have its own natural water spring in Fanari mountain. Its water is of excellent quality and 100% safe to drink (unlike most villages, the town Hora & the rest of Cycladic islands in which you have to buy bottled water). 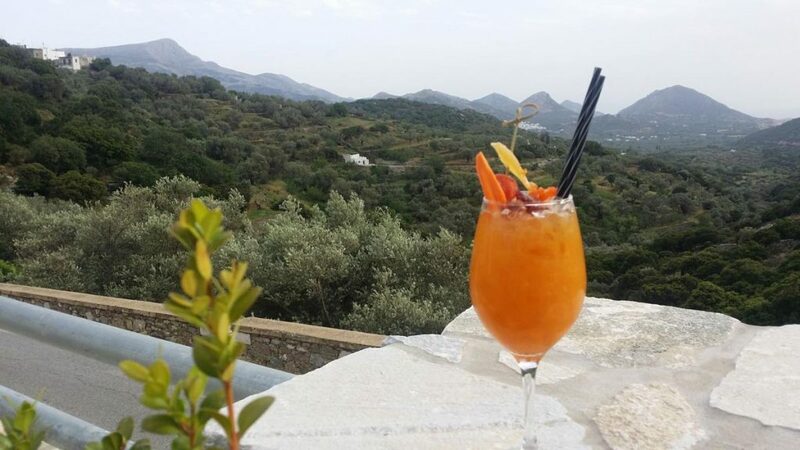 Relax and catch up scenic panoramic pictures accompanied by the rhythm of Chill-out music in a secluded dynamic location in central Naxos, with spectacular sunrises and sunsets, pristine landscape & birds’ chirping. In an environment full of Character, Atmosphere, Dreamlike Scenery, Service and Hospitality, admire what is unfolding in front of you, let it soak it in, Drink Clean and Collect Everlasting Moments!!! Signature Cocktails with a native twist that will awake your senses. Their aromas & flavors will seduce you if you love novelty, uniqueness and have a passion for the fresh, exotic and creative essences. Morning juices: A tasty way to pack a ton of healthy nutrients into a drinkable treat that’ll make you feel great the whole day. Quench your thirst in the most nutritional way with our Great Taste Award Organic Juices: 100% Greek Fruits, Gluten-Free, No additives, No added sugar. Healthy Detox Juices & Smoothies – A great way to kick start healthy momentum! All-natural, seasonal, unsweetened fruit and Vegetable juices. Do your body some good with these delicious Antioxidant Blasts packed with mighty ingredients. Eclectic Awarded Brands of Barrel Aged Tsipouro: no gluten. The tsipouro is a pure grape pomace distillate, caramel colored spirit with flavor that resembles whiskey (similar to Italian Grappa). Tsipouro is not sweet, like ouzo, it is considered to be better combined with “stronger” and more spicy dishes. 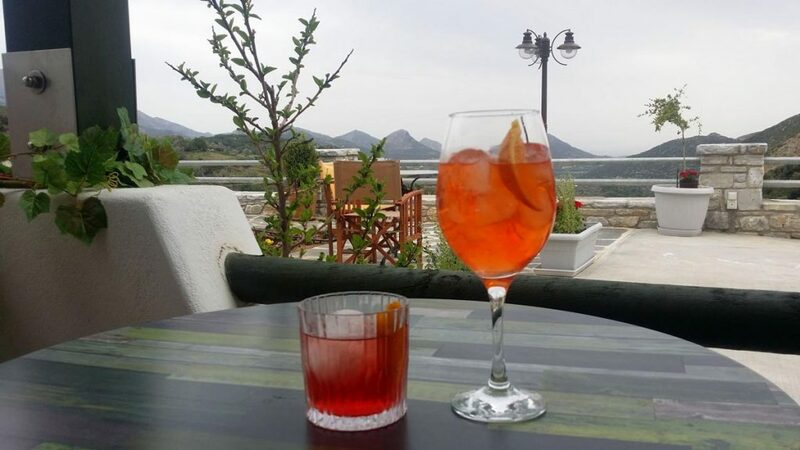 It is a good aperitif before lunch or dinner. Our Mission is: Responsible Tourism because we believe Nature is the world, the sponsor and the teacher of human abundance and those that travel the world also care about it. Anyway, the micro-decisions we make daily affect our short-term and long-term goals alike. All our fruits (by Nature & Art), and wine & raki are made from local healthy farms & vineyards without additives, pesticides, herbicides, fungicides, insecticides, and chemical fertilizers which means you remove the negative side effects typically associated with drinking. That means no stomach aches, hangovers, headaches, rashes, or any of the usual symptoms. We welcome everyone with care and attention from the very first minute they step into ELaiolithos. Let yourself be pampered by the friendly staff, and taste a drink pleasing to the eye and to the palate. Embark on an exciting journey that expresses the identity of the Naxian people and exercises your mind with knowledge and wisdom.